Maybe I used to be living under a rock, but before our switch to “real food” I had never before purchased or cooked with dates. And I am just being honest here, but it’s possible I didn’t even know what dates were. Believe it or not Medjool dates are one of the oldest cultivated fruits in the world, which means they are also a whole food, of course. :) And even here in North Carolina you can easily find fresh Natural Delights Medjool dates at several local grocery stores including Harris Teeter, some Lowe’s locations and soon Earth Fare as well. The great thing about Medjool dates is that they are so sweet so they can basically act as a sweetener in recipes. And when you are avoiding refined sugar you start to get creative when it comes to satisfying your sweet tooth. A few weeks after starting our “100 Days of Real Food” pledge a reader actually suggested a “chocolate torte/truffle” recipe to me (pictured) using Medjool dates, and looking back I honestly don’t think I would have survived our pledge without them! So today, I’d like to share three more recipes using Medjool dates in case you are new to this versatile sweet fruit as well. 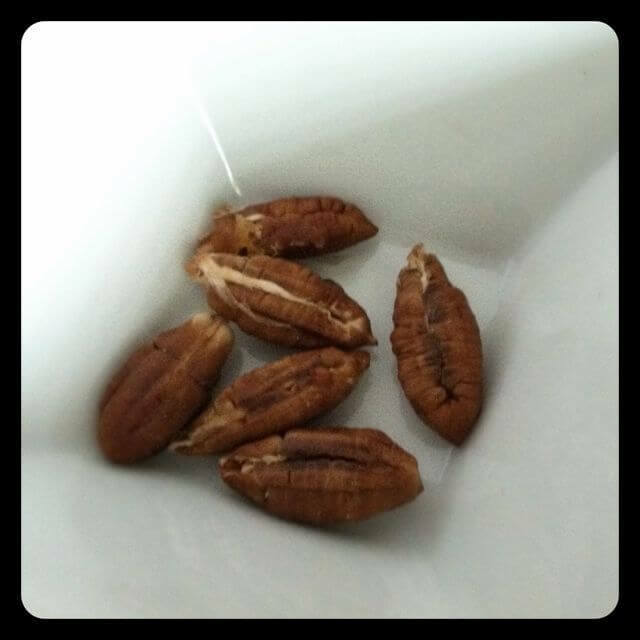 I do want to caution you though that even though the date seeds look like little pecans they are hard as a rock (pictured), so whatever you do be extra careful to remove the seeds first! A simple and flavorful appetizer from the Medjool Date website. Split one side of Medjool date lengthwise and remove pit. Wrap entire bacon strip around date and secure with toothpick. To prevent toothpicks from burning soak them in water for a few minutes first. Turn once to ensure even cooking and drain well (about 3 minutes per side worked well in our oven). Serve warm / immediately. *To make this Peanut/Tree Nut Free omit the optional nuts. A fun snack for the kids adapted from the Medjool Date website. Cut each pita bread in half, crosswise, to form four pita pockets. Gently open each pita pocket and spread 1 tablespoon of peanut butter to each of the interior sides. Top the peanut butter with the chopped dates, which have been evenly divided. Add the banana slices to each pita sandwich and then gently press the sides together to reform pita pockets. Eat immediately or grill on a panini grill for something extra special! Combine all ingredients into a blender and puree together until smooth. Enjoy! 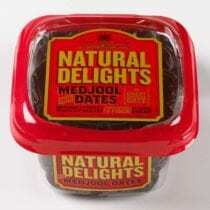 This post has been brought to you by Bard Valley Natural Delights Medjool Dates. They are part of the Mediterranean Foods Alliance, which helps consumers discover the health benefits of Mediterranean foods. Tomorrow kicks off Mediterranean Diet Month so be sure to check out the details. Oh, I love dates! Medjool especially. They’re great as a sweet snack just popped straight out of the container too! So glad you discovered them for yourself. In the first recipe you can sub goat cheese or feta instead of the nuts (I’m allergic)inside the dates and its divine. Question though, I have only bought dried pitted dates (like the kind by sun maid) is there another brand that is better? Can you buy a date that isn’t dried? Or is a date a dried form of some other fruit? Grape=raisin. Would it be better to buy the kind with pit and take pit out myself? Also, strange question, but anyone ever used dates to sweeten hot tea? How might I attempt this? I’m thinking cook the dates down to some sort of sryup? Maybe i’m just dreaming! This new real food journey is exciting and confusing, but I want to learn! Thanks for everything! I have some of the same questions (e.g. what specific kind of date is best and should they come with the pits for some reason) so thanks for asking! You can buy dates fresh or dried. The Medjool dates pictured at the top of the post are fresh (containing seeds and all). A common type to buy dried is called “Deglet Noor” which are typically sold chopped and pitted. I can’t speak to what’s better …just like there are different types of apples there are different types of dates, but I would think if you could get fresh over dried it would be the way to go. I have recently discovered dates as well. I bought some LARA bars and decided that i needed to make my own. I processed some peanut butter with dates and some different flavorings like cinnamon and vanilla. Then I added some more chopped nuts after it was all blended up. Put them into silicone cupcake holders and tossed them in the fridge. They are a perfect addition to lunches and as afternoon snacks. Dates rock! I’m totally trying your smoothie recipe! We love medjool dates I cut them up in our hot cereal, then I sprinkle coconut and almonds on top. Thanks for sharing your recipes. I will give them a try. I would also like to know if the prepackaged, dried and pitted dates are not as good. I love to cook dates down with an equal amount of water for 45 minutes at a simmer. Let them cool for fifteen minutes, then process until smooth. I then use this as a substitute for sugar in baked goods. It makes muffins incredibly moist. Karen – I just answered Casey…and as I said to her there are different varieties of dates, which are just different (not better/worse), but I would think with any produce fresh would be the way to go (over dried) if it’s something you can find. But if not dried fruit in general is certainly still a great choice especially over all the highly processed options out there! We buy organic medjool dates from the bulk section at our supermarket. I prefer whole dates because they are moister than the pitted ones. One of my favorite sweet snacks is dates stuffed with a dab of natural peanut butter. 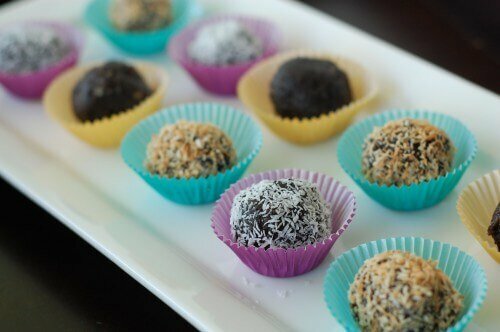 I would also highly recommend the recipe for chocolate bliss balls posted on the food matters website. I made them as a treat for my husband for easter. Just a few simple ingredients and they were to die for. MMM, the bacon ones sound so good! I like them just stuffed with some cream cheese..those goat cheese or feta ones sound good too. Sweet and savory! I love bacon wrapped prunes – definitely will try with the dates! Thanks! Yum! One of my favorite appetizers to make: stuff with goat cheese, wrap in bacon or prosciutto, then drizzle with honey and sprinkle cinnamon. Absolutely divine! I love Medjool dates, to, but they are very high on the glycemic index, so you do have to think of them as a sweetener. They really aren’t for casual snacking – it would be like swallowing spoonfuls of sugar. Actually according to my contacts with Medjool Dates they are considered between low and medium glycemic reading. Like you, I just discovered dates for the first time after starting to eat healthy foods! I was so embarrassed, I’m glad I know I’m not the only one! :-) Love the simplicity of these date recipes! I’ve used dates in raw cakes and brownies. Love them! All things in moderation though, because they are hard to digest and very high in (natural, but condensed) sugar. I have been using Medjool dates this past month for the first time and I love them. However, I really wish I had a good high-powered blender because the one I have doesn’t break them up enough. The food processor isn’t very good either. My sister is planning on buying me a blender. What I would give for a VitaMix! I don’t know the difference between medjool and regular, but I, too, have used dates to make homemade Larabars. I used to buy granola with raisins and dates that I’d like to try to recreate! This is great to know! We live in Jerusalem and we have an enormous supply of Medjool dates. Thanks! Homemade larabars are super easy. half dates, half nuts (although my husband has trouble digesting nuts so I use natural peanut butter for his.) then flavorings of your choice. I like oatmeal, unsweetened coconut, and unsweetened cocoa powder, or raisins to make a pb&j. I always put in some ground flax or chia to get a little extra nutritional boost. I am coming to the end of doing the Whole30 challenge and I honestly had never considered using dates as a sweetener. Love the idea. And the bacon wrapped dates….oh wow…those sound amazing! Lisa-I love the idea of putting them in a sandwhich. Dates are the best sweetener for treats. You can make a paste out of them and add them to things. My favorite thing to do with dates is make lara bars with them it saves you a ton of money and they taste the exact same! This is good news! Many thanks! I just discovered dates as well. I love throwing them in a smoothies and my larabars. I am going to try putting them in his sandwiches, brilliant! I buy my dates at Costco. I don’t think they are medjool but I can’t think of what kind they are. They are very moist despite being pitted. I bought them when I got tired of having to pit the medjool ones I bought and don’t regret it! Love all the recipes – can’t wait to try – but before I wonder around HT like a crazy woman – where might I find these dates? PS I’ve been reading your blog from Waxhaw and just figured out you were from Matthews :) – small world! It is a small world! And I usually go to Earth Fare myself…their dates are near the produce so check there first and secondly near the raisins. Good luck! Went to Harris Teeter and Lowes today to look for them, but could only find the Regulat Sun Maid variety. Are they not with the regular dried fruits? They are usually in the produce section at HT. They are in the produce section since they are fresh (not dried). I really like dates and use them as sweeteners in smoothies. I printed off your recipes and cannot wait to use them. I never even thought about dates before this post. I read this, then last night I went to Fresh Market and they had Pecan Date Rolls from the The Jewel Date Co. They are DELICIOUS! My husband didn’t like them so I guess I get them all to myself! And only two ingredients, dates and pecans! Thanks for the recipes. I am lucky enough to have a date palm growing in my garden. I have thousands of dates so I was looking for ways to use them. Fresh dates off the palm are completely different to the dates you buy in the shops. Shop bought ones are much harder and chewier. The fresh dates are really soft and sweet. I was never a fan of them when I was a child but I’m a big fan now! I just tried dates for the first time. (I planned to make the Lara bars but our family ate most of my cashews first). Anyway, I ate a date with a few raw cashews and it immediately made me think of pecan pie! Has anyone used them as a sub for the refined sugars to make a pecan pie-like dessert? I use them as a sweetener in pumpkin pie. My very picky 9 year old loves it! I purÃ©e in my food processor and add to the other ingredients instead of any sugar. I have not tried in a pecan pie but think it would be delish! 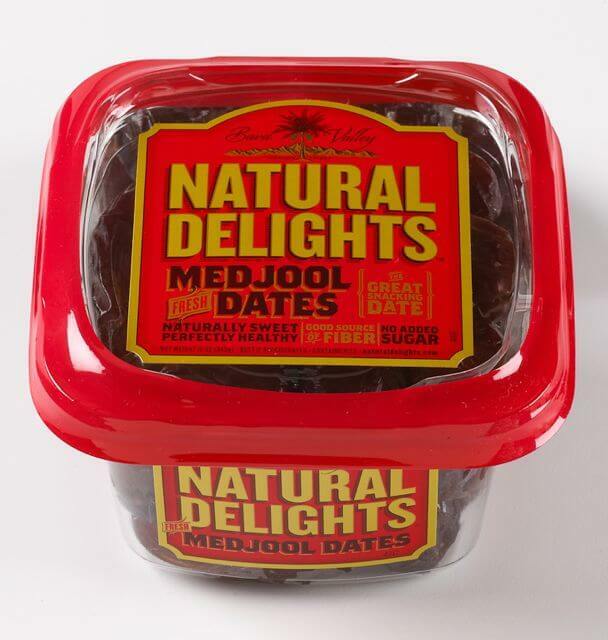 I have discovered Natural Delights Medjool Dates recenlty. I remove the pit and put a natural (oil separated on top) crunchy peanut butter inside, close them again. OMGosh this is an awesome dessert. I usually eat one, and sometimes eat two. I have also used dates in smoothies. They have a lot of fiber and are so good for you. Much better snack or dessert than something made from refined sugar. Great for traveling, too, although good dates may be a bit sticky, better to eat at a rest stop with an apple. I love medjool dates! I use them all of the time as a sweetener. My son has a milk allergy so I make hemp milk and sweeten it with a couple of medjool dates. I also chop one up and put it in our morning oatmeal, tastes just like I added a sweetener. I cannot wait to try the bacon wrapped dates, they look yummy!!! Hi, loving your recipes! Another suggestion for the dates is to put a chunk of pineapple inside the date and then wrap in bacon and broil-delicious!!!! I wanted something a little different for my morning smoothie and decided to give this a go. It’s delicious! I think I’ll turn this into ice cream for my kids later this week. I’m going to put this one in my recipe box (I do fruit/veggie smoothies each morning and don’t want to get stuck in a rut so I have a huge – and growing – list of recipes). Next time, I think I’ll add a spoon of almond butter and see how that tastes. Hi! Love all the date recipes, since I love dates!! My question though, is, do you have to buy Medjool dates or can you use any pitted dates? Seems like I can find other dates less expensive…. I found your site because I have a dear friend who came here from Iran and she brings me gifts of dates from Montreal and I was looking for ideas to cook with them. We love yogurt smoothies, and I’m excited about using 3 or 4 dates to sweeten them instead of sugar. I break up my very ripe bananas into small chunks and freeze them for smoothies. Using frozen fruit eliminates needing to use ice cubes to cool off the smoothies. Thanks for your recipe ideas! I love dates in my overnight oatmeal. So amazing! Your vegan friends might not delight but the bacon wrapped dates are the pot luck item that will disappear first. Decadent and delicious. My family and I just made the smoothie, delicious!!!! I used almond milk and added a large handful of organic baby spinach… My kids loved it! Even the husband loved it! This is the first smoothie I have made with spinach that you couldn’t taste the spinach. I like spinach, I don’t like tasting it in smoothies though. The medjool dates are so amazing for sweetness. Thank you so much for the recipe!! !